And a lot of debug too from him ! 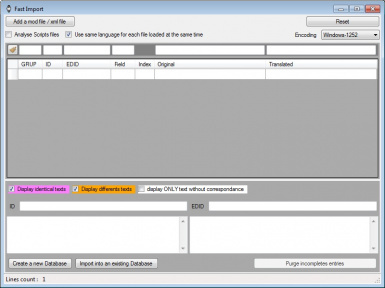 - Added Analysis dictionary. They're used to put in comments, when possible, the race of the NPC, and the NPC who say an INFO line (for Skyrim and Fallout 4). 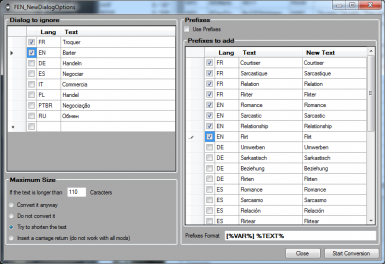 Dictionaries are in english, but you can generate them in your language by using the window Generate analysis dictionary (database menu). - Improved Automatic translation 5. - Added an option (in database tab) to replace lines with the same color when loading xml. Even validated lines (green) are replaced with this. Useful when working on a translation with other people. 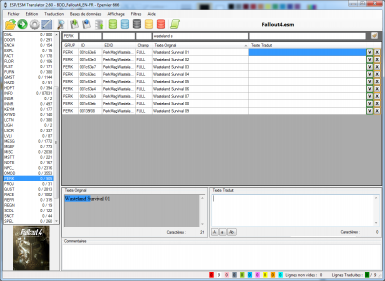 - Added complete log window (Display menu). Before, you could see the log on one line. Now you can on all at the same time. Useful to visualize what you did. - Added the ability to ignore a line. When a line is ignored, it's not used for translation, and it does not count for the total on the left grup list. So if you ignore the two TES4 lines, on the left list, you will see "TES4 0/0" in green. - With that, I also made scripts for Morrowind, Oblivion, Fallout 3 and New Vegas to be ignored if nothing is to translate in them. - Fast Import Window redone. It's easier and faster to create your own databases. - Added Partial Save : If you work in a team, you can save just a part of the table and send it to your coworkers. - Added Images on the main window line. You can hide the column in the display menu. - Added little support for using Nifskope(version 2.x), disabled by default (go in the options window to activate and configure it). This allows to display nif model of an object added by the mod. The tools will extact the file if it's inside a bsa, and will add (in the registry base) the folder of the mod, or the bsa, as a resource for nifskope, then will remove them when closing the tool. Useful if you don't know what an object is exactly. - Because of nifskope, I had to be able to manage morrowind bsa. Not really useful, but it's there. 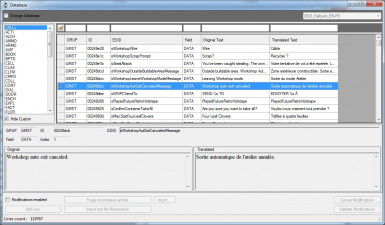 - Fixed Auto Translation 3 import into Auto Translation 5. - I "Think" I fixed the diverses bugs with chinese/russian/japanese... caracters. - Ignored texts are now used in instant translation, and so, in automatics translation. They works without numbers too. - Automatic Translation 5 is now recursive. For example, if you add in it %VAR01% and a carriage return and %VAR02%, and the same in translated, the tool will try to translate line by line a text. Great for recipies. A lot of things are possible with this now. I let you experiment. - Adding the ability to define the time between each automatic saving. - Adding the ability to apply automatic translation when loading a database or a saved file. But know that this loading will take much more time. - Modified spellcheck. Before, it was only available in french, english, italian and spanish (I think). Now it uses Hunspell dictionnary. I provide some, but not all. You have to define which dictionnary to use for each text field (once) Just click on the button "#". - Modified all text fields. Spellcheck, font change, ability to display space and carriage return (like word). Very useful. - Script are now colored (approcimately). More friendly to understand them. - Fixes and improvements here and there. - Added an option (enabled by default) to analyse all scripts which are present in the script folder of the mod. - Fixed in the Auto Translation 5. Now it works even with only one variable. That way, it can replace the auto translation 1 and 3 (but will not fire automatically like these two). - Modified the fast import window. You can now import xml files. So if, by example, want a french/russian datatabse, simply load into the window the english/french database, and choose to import the translated column into the original column, then load the english russian database, and choose to import the translated column into the translated column. And that's it. - Fix in reading or writing some bsa files. I had never encountered the case before. Found it in the mod Etac. - You can now reintegrate strings and scripts files into ba2 archives of Fallout 4. Warning : Only existing files will be reinjected in the ba2. New ones will be created as loose files. - The log window can now stay open. So when you select a line, you can see its previous values (for the current session). - It's trivial, but I changed the color of the selected lines, to math their actual color. - Changed the way the bak files are handled. - Adding an automatic translation 5. It does sensibly the same thing than the regex translation of Fallout4Translator, but works differently. You can use up to 100 variables on it. Here's an example (the same than in F4T) : If you put in there "%VAR01% -> %VAR02%" and if in a mod you have "something -> something else", the text will be translated. It uses the instant translation, so punctuation and numbers are not important. I feel like a cheater to takes idea from someone else, but it was a good idea. 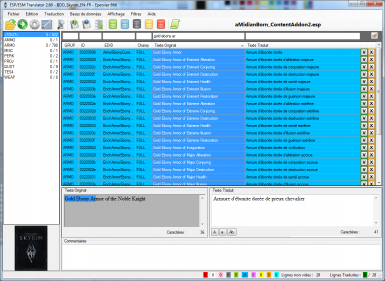 - The tool can now analyse (but not translate) tlk file from mass effect, dragon age 1 & 2 and Neverwinter Nights 1 & 2. It is useful only to create new databases. But the tools is still able to translate tlk files from Baldur's Gate 1 & 2, Planescape Torment, IcewindDale 1 & 2, Kotor 1 & 2... Enhanced Edition too. But don't forget to set the right codepage in the options. 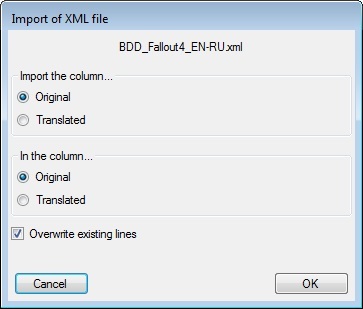 - Fixes bugs in analyse and translation of fallout 4 VMAD. - Filters have changed. You can now add in them OR " || " or AND " && ". Both at the same time is not possible. Spaces before and after symbols are important. Example : You can filter by "potion || elixir" to finc texts which contains potion or elixir. 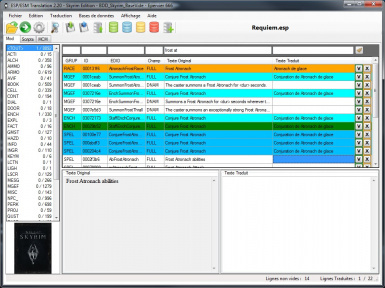 - Added a fast import windows, allowing to quickly create database. Just open the window, and drag and drop mod files (esm esp tlk...) on it. Or use the browse button. If you drag and drop 2 files, the first one will be treated as original and then second one as translation. - Impoved Instant Translation, which is used by a lot of things. Now, translation without punctuation/numbers takes in account "-" or "+" before the numbers. - The tool can now load in memory the mod before analyse. It's faster but more RAM consumption. You can modify it in the options (enable by default). - Update of the English/Chinese database and of the English/Japanese database (Thanks to Neanka and to Julio131). - Added a bsa/ba2 "browser". You can directly open bsa and ba2 files (answer YES to the question) and see and extract what's inside. (except for BA2 Texture file...no extraction for that for now). 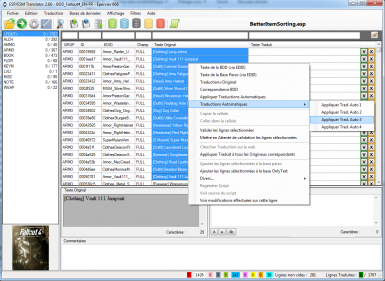 - For Fallout 4, Analyse and translation of a mod containing strings or scripts in a ba2 works now. No reintegration in the ba2 for now. You can test with Automatron. - For Baldur's Gate fans, you can now open and translate Weidu mods (tp2 file). Take care, it doesn't work with all the versions, but it's a first step. - Fixed little things everywhere, but mainly in the code (invisible for you). - Fixed a BIG BUG !!! The function I use to get lines ID was brocken. I suppose I just made a typo when compiling the tool. So a lot of things didn't work anymore. It's fixed ! Sorry ! - Importation is now a lot faster ! - Fixed a bug when translating vmad in skyrim with a localized mod. Before, the esp/esm was not modified if the mod was localized. Now it is. - Added an option to ignore the CRC of the mods when saving/loading a translation. I do not advise this option, because you can easily overwrite a translation you didn't wish to. - Added an option to auto validate lines when pressing CTRL+Enter in the main window. - Added an option to not asking to overwrite already filled cells when copy/paste in the main window. - Adding a new function 'Translation Sentence by sentence". This thing will try to translate separatly all sentence of a text, and then assemble it.. Very useful for Dialog. It replaces the old "Translation line by line". The dictionnary generated for this function is automatic, meaning there can be mistakes : The tools takes in the main database the original and split it with ". ", "! ", ..., do the same with the translated text, and if the numbers of results are equals, they're added to the dictionnary. i will "improve" that in the future, using the suggestion tab. But it's already very useful. 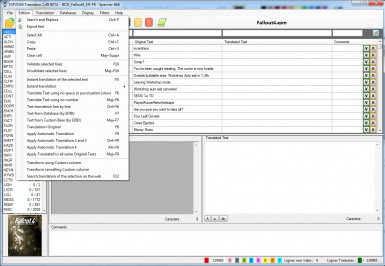 - I have added a lot of check in the startup of the tool. Now, if it does'nt start, you should have a debug file which will tell me where it's going wrong. - Fixed a little bug in the automatic translation : The first thing the tools do when doing that is to check in the current mod for same original teext. But if you had not empty lines in grey (database text, but with no original corresponding, so basing on GRUP+ID+EDID+FIELD+INDEX (like when you hit F7)), it used that, and so it was wrong. It's fixed. - Fixed a little bu in fomod translation. - Modified how are handle the different databases and their dictionnary. Faster and more efficient. 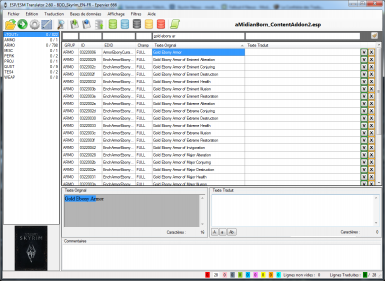 - The first loading of the databases is now in background. It means that you can start analysing a mod right now, but if you wish to open a database, you'll have to wait for the end of the loading. - Translations without punctuation and numeric are now directly included in the instant translation (F5), and in the application of databases or saved translations. - I've completly redone the NewDialog Options. You have access to it when you launch this conversion. - You can now translate fomod files (info.xml and moduleconfig.xml). - I've redone a lot of little proccess here and there. - On the Nexus pages, I've written little articles to understand some things that can be obscure. - And as usual, especially this time, i've made little things everywhere. 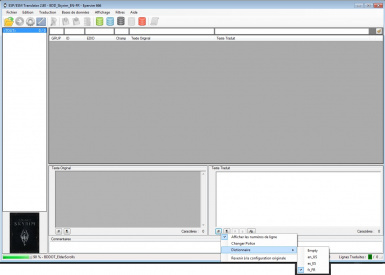 - Added an option in the file menu to transform a mod into the NewDialog Mod format. You can user parameters for this, in the option window. - Removed registry base options. It was pretty useless. - As usual fixes and improvements here and there (yes, it's a way to tell I don't remember everything I did. - In Automatic Translation 3, you can now choose to not precise GRUP and FIELD. To translate mods which prefix object to better sort them, it's now really easy and fast. - Fixed a bug when translating strings files. - Optimized changing GRUP in the main window, for BIIIIG mods ! - I have added the missing remaining GRUP and FIELD. This is now complete. Updated Databases will be uploaded. - The application can now analyse VMAD (scripts properties linked to fields) correctly for Fallout 4. You have to activate the corresponding option (in the... option window). This is still not recommended. Generally, there is nothing to translate in there. - I have modified the window allowing to translate the application. It's morte efficient now. - You can now define a default database to load for each game. Not mandatory, but you can. General Option Tab (first one) in the Option window. - Bugs fixes here and there (as usual). 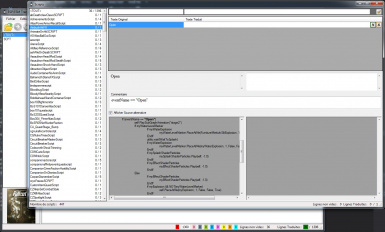 - You can now view the Fallout 4 script (pex) decompiled. 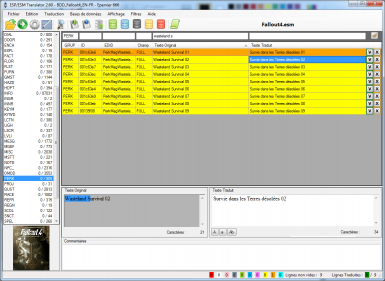 Not is all accurate in the new functions, because I have to see a real mod with pex files and real sources. - You can view scripts from bsa or ba2. Simply drag and drop your fallout 4 - MISC.Ba2 or the skyrim one on the main window. - If you want to see all scripts from fallout 4, do as said juste above, and check the option box to add ALL scripts texts. - That's all for now. All is not perfect for Fallout 4 (I can't analyse VMAD correctly for now), and we have to wait for real mod to really finish the job. - I'm stupid. I completly changed the way I handled strings files, but... I test this only with Fallout 4 et skyrim main esm. Now, for Skyrim, the translation of non localized mod (without strings file) is working again. Sorry !! The New version and its future updates will be hosted on the Skyrim Special Edition Nexus. La nouvelle version et toutes ses futures mises à jour seront hébergées sur le site Skyrim Special Edition Nexus. Lien juste au dessus. Notes : I've written some articles. Take a look ! For french people, scroll down / la description française est plus bas. This application have been made to translate mods. 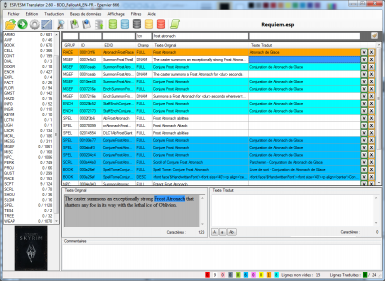 The application works with databases (you have to download one on the download page, or built yours), which contains every text of the game, in english and in another language (depending the database). At first, I have made this mod for my personal usage, because I was tired of my game being in two language, despite the fact that my installed mods weren't supposed to change text. - Look behind you, a three-headed monkey ! A BIG thanks to the forums of Canard PC, of Confrérie des Traducteurs and of Wiwiland for their helps and feedbacks. And thanks to the Nexus community, for the same reason ! Ce programme a été écrit pour traduire les mods. Le programme fonctionne à l'aide d'une base de données (à télécharger séparément, ou à construire soi-même), qui contient tous les textes en anglais en en français des jeux. Le programme peut traduire les scripts des jeux directement (pas besoin de recompilation), ainsi que les menus MCM. 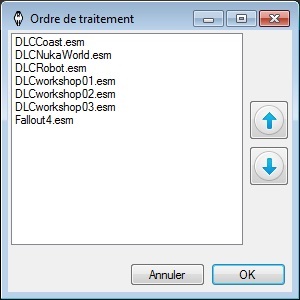 Il permet aussi de décompiler les scripts de Skyrim et de Fallout 4 ! - Plus qu'à cliquer sur le bouton "lancer la traduction" (flèche verte) et vous êtes bon. Au départ, j'ai fait ce programme pour moi, parce que j'en avais ras le bol que mes mods changent la langue de certains trucs, alors que les mods en question ne touchaient pas au texte. Pour ce genre de mod (comme les mods d'éclairage, de changement de stat), la traduction est presque entièrement automatique. Pour info, les manuels fournis ne sont PAS à jour. C'est long et j'avoue avoir un peu la flemme. Si un jour quelqu'un fait un tuto, qu'il n'hésite pas ! Un grand Merci aux forums de Canard PC, de la Confrérie des Traducteurs et à Wiwiland pour leur aide et leurs retours. Merci aussi à la communauté du Nexus pour les mêmes raisons. Amélioration de l'analyse et de la traduction des scripts de Oblivion / Fallout 3 /Fallout New Vegas. Ajout de dictionnaires d'analyse. Ils sont utilisé pour mettre dans les commentaires, quand c'est possible, la race des NPCs et le NPC qui prononce en jeu un INFO (pour Skyrim et Fallout 4). Ça évite au programme de taper dans la base de données chargée (qui n'est pas forcément la bonne). Ces dictionnaires sont en anglais, mais vous pouvez les générer depuis la fenêtre idoine, dans le menu Base de données. Ajout d'une option, (dans l'onglet base de données) qui permet de remplacé les lignes de même couleur quand on charge un xml. Avec ça, même les lignes validées (vertes) sont remplacées si le xml chargée contient la même ligne validée. Utile quand on bosse à plusieurs sur une traduction, et qu'on veut être sûr de récupérer les modifications de ses camarades. J'ai ajouté une fenêtre d'historique complet (menu affichage). Auparavant, vous pouviez visualiser l'historique d'une ligne à la fois. Maintenant, c'est tout ce que vous avez fait. Ajout de la possibilité d'ignorer une ligne. Quand une ligne est ignorée, elle n'est bien sûr pas utilisée pour la traduction, et surtout, elle ne compte pas dans le total de la liste des grup de gauche. Du coup, si vous ignorez par exemple les deux lignes TES4, vous aurez à gauche "TES4 0/0", en vert. Avec ce truc, j'ai fait en sorte que les scripts SCTX de Morrowind, Oblivion, Fallout 3 et New Vegas soient ignorés s'il n'y a rien à traduire dedans. Correction de ptits bugs ici et là. Comme d'hab. Refonte de la fenêtre d'importation rapide. Beaucoup plus pratique et plus rapide pour créer ses propres bases. Ajout de la sauvegarde partielle : Si vous bossez en équipe, vous pouvez sauvegarder juste une partie de la table pour l'envoyer à vos camarades traducteurs. Ajout d'images dans la table de la fenêtre principale. Vous pouvez choisir de cacher la colonne dans le menu affichage. Ajout d'un mini support de Nifskope, désactivé par défaut (dans les options pour l'activer et le configurer). Cela permet d'afficher à la demande les modèles (.nif) d'un objet ajouté par le mod. Le prog extraira le fichier d'un bsa si nécessaire. De plus, avant de lancer Nifskope, il ajoutera (via la base de registre) le répertoire du mod ou son bsa dans la liste des sources de nifskope, puis les supprimera à la fermeture du programme. Pratique si on ne sait pas quel est l'objet qu'on traduit. 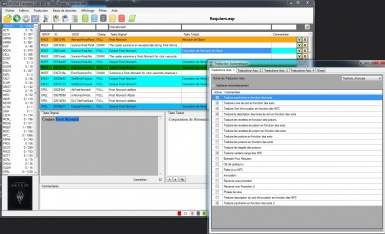 Correction de l'importation des Trad Auto 3 dans les trad auto 5. 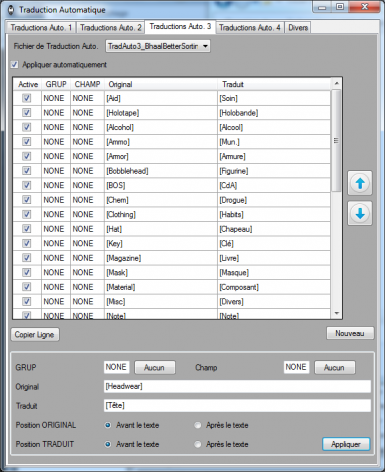 Ajout de la possibilité d'utiliser la Table de la Trad Auto 4 dans la traduction instantanée (et donc dans tout ce qui en découle, comme la trad auto 5). Diverses corrections et améliorations mineures. Différents ajouts et modification dans les trads Autos. Les textes ignorés sont désormais pris en compte dans la traduction instantanée. Et du coup dans la traduction automatique aussi. La traduction automatique 5 est maintenant récursive. Si par exemple on ajoute dedans %VAR01% suivi d'un retour à la ligne, puis d'un %VAR02% (et la même chose dans la traduction), bah le prog traduira le champ ligne à ligne. Super pratique pour les recettes de potions par exemple. Pas mal de choses sont possibles avec cette récursivité. Je vous laisse expérimenter. Ajout de la possibilité de définir la temps entre chaque sauvegarde automatique. 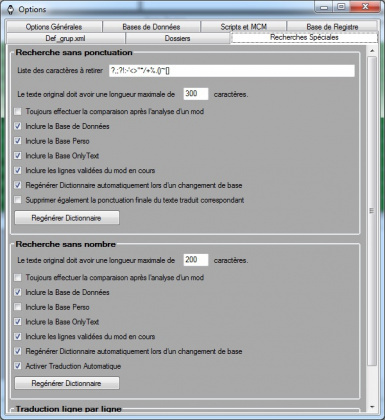 Modification de la correction orthographique. Le programme utilise désormais les dictionnaires Hunspell. Il vous faut définir (une seule fois) le dictionnaire pour chaque champ texte, en cliquant sur le bouton #. Grâce à ça, vous pourrez avoir des synonymes sur les champs anglais par exemple. Modification de tous les champs textes. Correction d'orthographe, changement de police, possibilité d'afficher les espaces et les retours chariots (comme sous Word). Très pratique. Modification de l'affichage des sources de scripts, avec coloration syntaxique (approximative). Plus pratique pour s'y retrouver. Diverses améliorations ici et là. Correction dans l'analyse des scripts de Skyrim quand ceux-ci n'étaient pas dans un bsa. Ajout d'une option (activée par défaut) pour analyser tous les scripts se trouvant dans le répertoire script du mod. Correction dans la trad instantanée : peut-être que le prog a quitté brutalement dans cette fonction. J'avais laissé un "stop" dans mon code par erreur. Modification de la fenêtre d'importation rapide. On peut maintenant importer des fichiers XML. Du coup, si vous voulez une base Russe/Francais, il suffit d'importer la base anglais/russe, en choisissant d'importer la colonne traduit dans la colonne original, puis d'importer la base anglais/francais, en choisissant d'importer la colonne traduit dans la colonne traduit. Et voilà ! Le but du jeu est surtout à terme de fournir directement des bases avec une seule colonne, pour que vous creiez les votres facilement et comme vous le désirez (en ajoutant les PNO par dessus par exemple). Correction dans la lecture et l'écriture de certains fichiers bsa. (rencontré une seule fois dan le mod Etac). Il est maintenant possible de réintégrer les fichiers scripts/strings dans les archives ba2 de fallout 4. Attention, seuls les fichiers existants seront réintégrés. Les nouveaux seront créés à part. J'ai ajouté la possibilité de voir toutes les modifications s'appliquant quand on fait certaines opérations (F5, modification manuelle, F9...) Désactivé par défaut. Voir dans les options (onglet divers). La fenêtre d'historique peut maintenant rester en arrière plan (ou au premier). Du coup, quand vous vous positionnez sur une ligne, vous voyez ses anciennes valeurs (pour la session en cours). Pour Morrowind, correction d'un bug d'analyse, dans le cas où un edid avait un espace final supplémentaire (c'est le cas pour Tamriel Rebuilt par exemple). C'est tout bête, mais j'ai changé la couleur de sélection des lignes. Du coup, on voit quand même la couleur de la ligne quand elle est sélectionnée. Correction de ptites coquilles ici et là. La réintégration dans les bsa de Skyrim était cassée. Elle est réparée. Grosse refonte de code interne. Ajout d'une traduction automatique 5. Elle fait un peu la même chose que la traduction par regex de Fallout4Translator, mais fonctionne différemment. Vous pouvez monter jusqu'à 100 variables différentes dans les textes. L'exemple est suffisamment parlant je pense mais au cas où : il faut entrer une structure de texte. Par exemple "%VAR01% -> %VAR02%". Ensuite, si dans le mod on a "Lieu quelconque 1 -> Lieu encore plus quelconque", bah ce sera traduit. Cette trad auto se base sur la traduction instantanée, donc la ponctuation ou les nombres ne sont pas importants. J'ai un peu l'impression de tricher en récupérant l'idée de quelqu'un d'autre, mais c'était une bonne idée. Le prog peut maintenant analyser (mais pas traduire) les fichiers tlk des mass effect, de dragon age 1 et 2 et des neverwinter nights 1 et 2. L'intérêt est simplement de pouvoir se créer des bases de données à partir de ces jeux. Il est toujours capable d'analyser et de traduire les fichiers tlk des baldur's gate et consors. Les filtres des différentes tables du prog ont changés. Vous pouvez maintenant ajouter des ou " || " OU des et " && ". Les deux en même temps ne sont pas possible. Il faut bien mettre les espaces avant et après les caractères de séparations. Ajout d'une fenêtre d'import rapide permettant de créer rapidement des bases de données. Il suffit d'ouvrir la fenêtre et de faire glisser des fichiers mods dessus. à chaque fois, le programme demandera s'il faut mettre ça dans la colonne original ou traduit. Si on en fait glisser deux d'un coup dessus, le programme prendra le premier en original et le second en traduit. Amélioration de la traduction instantanée utilisée par plein de truc. La traduction sans ponctuation/sans nombre prend maintenant en compte les signe + et - devant les nombres. Le prog peut maintenant charger en mémoire le mod avant de l'analyser. Ça va plus vite mais ça consomme plus de ram. On peut désactiver ça dans les options (activé par défaut). Mise à jour des bases Anglais/Chinois et Anglais/Japonais (merci à Neanka et à Julio131). Pour Fallout 4, l'analyse et la traduction d'un mod contenant des scripts ou des strings dans un fichier ba2 fonctionne maintenant. Pas de réintégration possible pour l'instant. Vous pouvez tester avec Automatron. Pour les fanas de Baldur's Gate, vous pouvez désormais ouvrir et traduire les mods Weidu de ce dernier (fichier tp2). Attention, ça ne fonctionne pas avec toutes les version. Correction de petites choses par ci par là, la plupart invisible (surtout du code interne). Correction d'un gros bug que j'ai du créer juste avant de compiler. La fonction que j'utilise pour récupérer les ID de toutes les lignes était cassée. Bêtement. Désolé. Mise à jour des bases de données pour coller avec la dernière version de Fallout 4. Correction d'un bug de traduction des vmad dans Skyrim quand le mod est localisé. Le prog ne touchait pas à l'esp/esm dans ce cas là. Maintenant si. L'importation est maintenant beaucoup plus rapide (dans la fenêtre du même nom). Ajout d'une option pour ne pas tenir compte des CRC des fichiers analysés lors de la sauvegarde et du rechargement de traduction. Je déconseille cette option. Sans le CRC, il est facile de remplacer une sauvegarde de traduction par une autre sans le faire exprès. Ajout d'une option pour valider automatiquement les lignes lorsque l'on fait CTRL+Entrée. Personnellement, je ne l'utilise pas, mais à vous de voir. Ajout d'une option pour ne pas demander de confirmation d'écrasement lors d'une opération de copier coller sur les cellules de la fenêtre principale. Comme d'hab, j'ai fait d'autres trucs à gauche à droite... mais me souviens plus lesquels. Sans doute rien de très important. Correction de Bug dans le copier coller de la fenêtre principale. Correction d'un bug lors de la réintégration dans un bsa (Skyrim). Ajout de la fonction "Traduction phrase par phrase". Ce truc là essaiera de traduire indépendamment chaque phrase d'un texte, et s'il réussi, d'assembler ces traductions. Cela remplace aussi la traduction ligne à ligne. 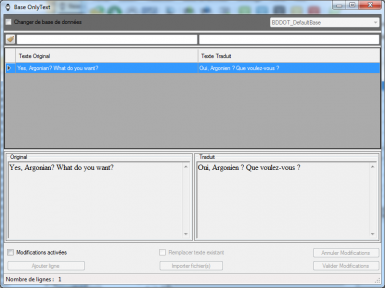 Hyper pratique pour les dialogues. Correction d'un bug lors du premier chargement des bases de données (vous pouviez aller directement dans les bases, alors que le prog aurait du vous faire attendre, histoire d'être sûr que la base soit totalement chargée). J'ai fait quelques modifs pour la fenêtre de recherche/remplacement. J'ai ajouté plein de contrôles sur le démarrage du prog. Ça devrait créer un fichier DEBUG s'il y a un problème au démarrage maintenant. Plus pratique pour aider les gens. Petite correction de bug sur la traduction automatique. La premiere chose que fait le prog était de récupérer les textes identiques dans le mod en cours. Mais si on avait des texte en gris (donc texte de la BDD, mais ne correspondant pas à l'original, mais seulement à GRUP ID EDID CHAMP INDEX), il les prenait en compte. C'est réglé :p Désolé ! Correction d'un bug dans la traduction des fomod. Grosses modifications dans tous les sens. D'où le saut de version. Modification de comment sont gérées les bases de données et leurs dictionnaires. Plus rapide et surtout plus efficace. Le premier chargement des bases de données se fait en arrière plan. Du coup, on peut lancer l'analyse d'un mod de suite. Par contre, si la première chose qu'on veut faire c'est ouvrir une base, il va falloir attendre un peu. La trad sans ponctuation et la trad numerique sont maintenant incluses dans la trad instantannée (F5), et lors du chargement d'une BDD ou d'une sauvegarde. J'ai refait les options pour le NewDialog de Fallout 4. Vous y avez accès quand vous lancez l'opération. Vous pouvez désormais traduire directement les fichiers fomod (info.xml et moduleconfig.xml). J'ai refait plein de petits processus à gauche à droite. Du fait des vitesses de recherche accrue, j'ai réuni ensemble les 4 traductions automatiques (F9). Sur la page du Nexus, j'ai fait quelques articles pour que vous voyez quelques trucs qui peuvent sembler obscurs. Ajout d'une option dans le menu fichier, qui permet de transformer un mod dans le format du mod NewDialog. Charger simplement le mod, cliquer sur l'option qui va bien dans le menu fichier, une ptite vérification manuelle histoire d'être sûr, et lancer la traduction. 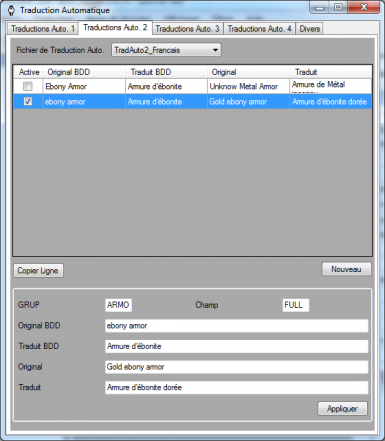 Correction d'un bug dans la traduction des scripts de Skyrim (bug introduit dans la version précédente). J'ai supprimé les options concernant la base de registre. ça servait pas à grand chose. J'ai aussi ajouté une option pour faire commencer tous les mots d'une ligne par une majuscule (via une option dans le clic droit). Dans les trads auto 3, vous pouvez maintenant choisir de ne pas tenir compte du grup et du champ. 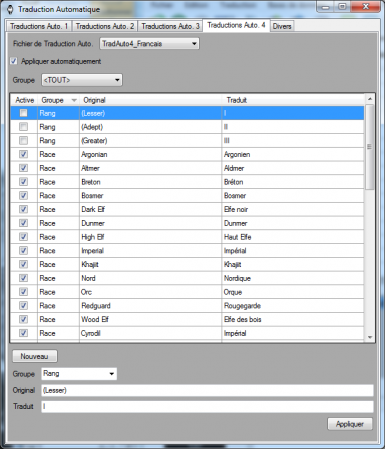 Du coup, concernant les traductions de mods qui prefixent simplement les objets (genre better sorting pour Skyrim), bah avec ça, ça va vite ! Correction d'un bug lors de la traduction des fichiers strings et des mods localisés. Vous pouviez avoir des textes identiques en VO, traduits différemment, mais la version traduite avait tous les textes pareils. C'est réglé. J'ai normalement accéléré la comparaison avec les bases de données. Et comme d'hab, 2, 3 ajustements ici et là. Le copier coller de la fenêtre principal a été modifié. Vous pouvez copier toute la table et la coller dans un excel par exemple. J'ai forcé la lecture et la traduction des mods de fallout 4 en utf8. Quelque soit les encodages sélectionnés dans les options. Le changement de GRUP dans la fenêtre principale devrait être un peu plus rapide maintenant, pour les groooooos mods. Il manquait encore certains GRUP et champ pour Fallout 4. Je les ai rajouté. La liste devrait être complète. J'ai ajouté le support des VMAD (paramètres de script) Pour Fallout 4. Il faut activer l'option correspondante dans les options. Bien sûr, c'est toujours déconseillé. Il n'y a rien en général là-dedans. 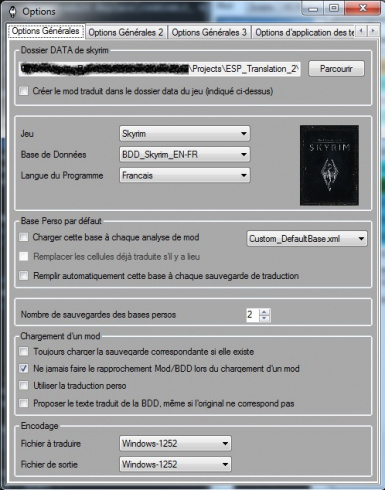 Je suis stupide... J'ai changé la manière d'analyser le fichiers strings, mais je n'avais pas testé correctement sur les mods non localisé de Skyrim. Ca remarche !! Désolé !! Possibilité de décompilation des scripts de Fallout 4. Pas tout à fait exact (car il faudrait que je mette la main sur une vraie source de script). J'ai créé les dernières fonctions avec mes mots à moi, je corrigerai quand les premiers mods verront le jour. Mais c'est très lisible ! Les scripts de Fallout 4 accepte des structure maintenant. Si z'êtes curieux, vous pouvez faire glisser le fichier BA2 de fallout qui contient les script sur la fenêtre du prog. Tous les scripts dedans seront analysés et vous pourrez voir leur source. Attention, il faudra activer dans les options la remontée de TOUS les textes des scripts (sinon, certains n'apparaîtront pas puisque rien à traduire dedans). Warning ! The "Package redistribuable Microsoft Visual C++ 2010 (x86)" is REQUIRED (or else, all compressed fields won't appear)!! Sorry for the inconvenience, this discover was made today. Attention ! Le "Package redistribuable Microsoft Visual C++ 2010 (x86)" est INDISPENSABLE (sinon, tous les champs compressés n'apparaîtront pas) !! !